The Ultimate Animal Experience? Losing A Memory Quiz To A Chimp : Krulwich Wonders... You've swum with dolphins, ridden camels, stalked tigers. 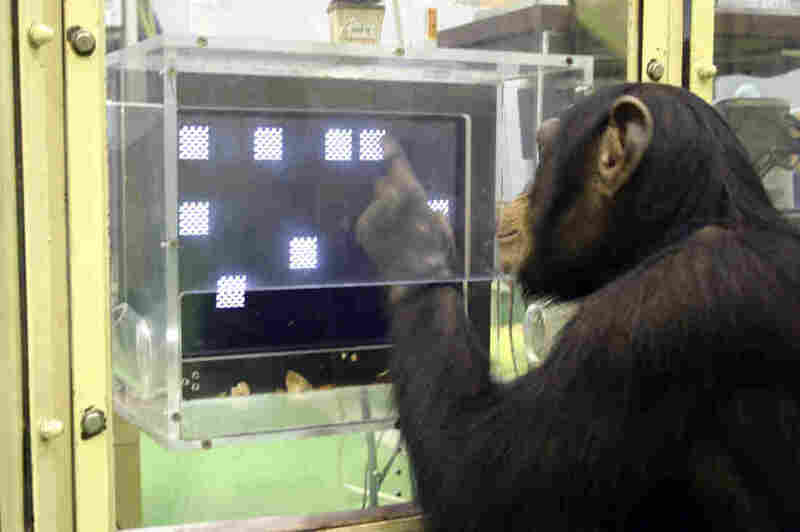 Now, try taking a memory test with a chimp — and losing. It's fun, humbling and mind-boggling. Time to be embarrassed. You're about to be bested by a young chimpanzee in a memory test. Many have tried to outperform Ayumu (that's the chimp's name), but when you see how easy it is for him, how matter-of-factly he gets things right, it's clear he's got a talent that's built in. It's not a talent you'd expect a chimp to have, but, hey, this isn't a trick. Nature isn't pro-human or pro-chimp. It's just nature. So here's the deal: You will see a screen. A bunch of numbers between 1 and 9 will flash on, but you will see them for less than a second. They show up in scattered spots, here, there and very quickly (650 milliseconds later for beginners, even faster in advanced versions). They will then be covered by little gray patches. You won't see them anymore. Your job? Remember which numbers were where, and touch the white patches in ascending order: 1, then 2, then 3, then 4, etc. If you're intimidated, don't be. It's not easy to beat this chimp. It's best to just watch. How'd he do it? Well, says science writer Virginia Morell in her new book Animal Wise, "it's impossible to track each number's position with one's eyes; you had to take in the entire pattern with a single glance." And yet, "Ayumu nearly always got the sequence right. His success rate was close to 80 percent." This tells Japanese scholar Tetsuro Matsuzawa "that he has an actual picture memory, an eidetic memory. ... He takes a picture with his mind and holds it." Even if he turns away from the screen to do something else, the information stays in Ayumu's head. "You and I," says Matsuzawa, "we cannot do this. ... It is something special for the chimpanzee mind. It is not a matter of training for them. It is their way of seeing the world." Ayumu learned his computer skills sitting on his mother's lap, watching. She is also a laboratory chimpanzee and has a computer of her own. Her son didn't interfere, didn't touch the keys. When Professor Matsuzawa gave him a little computer with a small touch screen, he explored it, but cautiously. "The mother does not offer any explanation. And her child, the apprentice, learns by careful observation," the professor says. But over time, he's gotten good. Is he exceptional? Will he stay this sharp when he's older? We won't know till we've tested many other chimps. But for a species that grows up in dense forests, where food is hiding in plain sight, a photographic memory might be very useful. Still, his performance leaves lots of people feeling uncomfortable. "How does he do that?" writes one YouTube reader. "I can barely see the numbers flash. ... I am more stupid than [a] chimp. Why God, why?" "This is not helping anyone," writes another. "It's decadent and it's wrong," writes someone else. "That's a million times better than I can ever do." "Well it's official. I am dumber than a chimp," says one more. Even scientists got upset. "You must see this," Matsuzawa told Morell, holding a science publication in the air. "In it," he told her, "the authors say that humans 'with practice' are as good as chimpanzees at our memory test." But why bother? Why would a bunch of scientists go to the trouble of training themselves to best a chimp? "Really, I cannot believe this," Matsuzawa said. "With Ayumu, as you saw, we discovered that chimpanzees are better than humans at one type of memory test. It is something a chimpanzee can do immediately, and it is one thing — one thing — that they are better at than humans. "I know this has upset people. ... And now here are researchers who have practiced to become 'as good as' a chimpanzee!' " he told Morell. "I really do not understand this need for us to always be superior in all domains. Or to be so separate, so unique from every other animal." We are just members of the animal kingdom, he says. Talented, to be sure, but not always Best. We should get over ourselves.